What do you do at Robert Kaufman Fabrics? I am the one who gets to post pictures of beautiful quilts and projects on social media, answer customer questions, chat with bloggers and help with all the behind-the-scenes advertising, marketing and content creation. I heard through friends at Generation Q magazine that Robert Kaufman Fabrics might be hiring and I jumped at the opportunity. I'd previously worked as an editor for an trade magazine in Portland, Oregon and am thrilled to continue working in an industry I love so much. What's your favorite fabric right now? I'm slightly obsessed with Blythe (designed by Rebecca Bischoff) that is in stores now. I love the rich colors and its uncluttered florals. Girly, but not too much. I'm planning to use it to line the wool coat I made. Do you have a favorite technique or pattern? I love the log cabin block and all its variations. My first twin-size quilt was a log cabin that took me twelve years to finish because I ran out of one of the fabrics. Oops. Last summer I was able to take a class with Susan Beal and we made some Modern Cross baby quilts for charity—it's my new favorite quick-and-easy block! I always have a few things going at once, but my top priority right now is finishing a fan quilt my great-grandma hand-pieced four decades ago. I'm a sucker for the neutrals, especially white, snow and ash (Konas, of course!). If you could spend a day with any quilter or designer, who would it be? 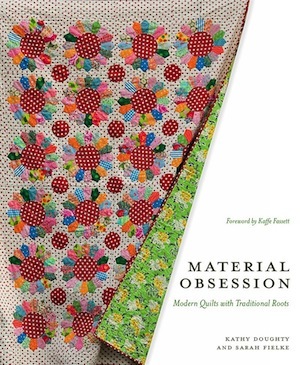 I've loved Laurie Wisbrun's fabrics since her first collection and I think her books are fabulous, so I would be thrilled to spend the day oohing and aahing over her designs and getting crafty with her. I'm a sucker for hand-sewing, yet I love to bust projects out in a day whenever possible. I love sewing clothes for people I love and teaching others to sew, as well. One of the things that I adore most about working with fabric, whether it's sewing or quilting, is that there is always more to learn, skills to master and fabric to hoard. Follow along with Teresa's sewing and quilting adventures via her blog and Instagram. Meet the New Folks: Elisabeth! I am the Event Coordinator, responsible for handling the logistics for trade shows, assisting in booth prep and managing quilt loans. If you come to a Quilt Market, you’ll likely see me wandering around the Robert Kaufman Fabrics booth, making sure things are flowing smoothly and everything is in its place. I have a serious love for quilting, sewing and fabric; so when I heard Robert Kaufman Fabrics was looking to grow their team, I knew I wanted to be a part of it. While I have not been in the industry before, this is an exciting leap into a whole new world. At the moment, I’m really enjoying Carolyn Friedlander’s Architextures. Each print is so beautiful and they work well with everything! 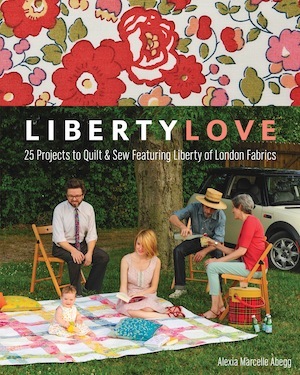 I love the Marcelle Medallion pattern from the Liberty Love book. I’ve made two and it has me addicted to the idea of creating more medallion quilts down the road. I am working on a few different things right now – like most quilters out there. I have a paper pieced neighborhood that’s slowly coming together, as well as a scrap quilt that just needs a back! I would love to spend a day with Suzy Ultman. I’m always attracted to her fabrics, even before I find out who designs them. She has such a talent for creating a whimsical and enchanting world. I’m a Disney nerd and I eat lots and lots of candy. I love seeing the creative community in force, and being inspired by the way different people view the world. I can’t wait to see where this journey takes me. Follow along with Elisabeth's sewing and quilting adventures via her blog and Instagram. 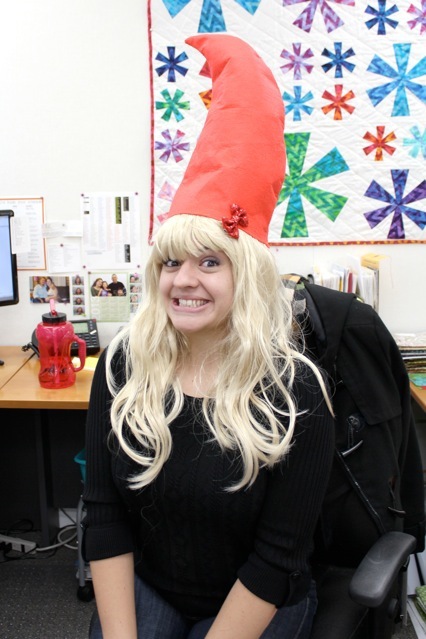 Meet the New Folks: Nichole! I am in charge of all things quilt-related. I help format the patterns that our fabric designers draft, search for patterns that will be complimentary to the fabric we release and hire quilt makers to create physical quilts and other sewn goods for stores and Quilt Market. I am a charter member of the Los Angeles Modern Quilt Guild, which has been supported by Robert Kaufman since its early days. A fellow member, Ramona Burke, is one of the amazing sewers for Robert Kaufman. When they were looking for someone to fill this position, she recommended me. I can’t say enough good things about what being a guild member has done for me. I have a wonderful network of friends and a support group of like-minded folks. We are always looking out for each other, and it’s great. I am addicted to Essex Linen and am so excited about all the new colors it’s going to be coming in. I use it in practically every project. I also love the Interweave Chambray and Chambray Union, which I can’t wait to make clothes with! My personal quilting style tends to be more improv, but I love a good trick! I loved the method used in the Scrappy Trip Along. I always have too many going on! But right now the most urgent are two quilts that I am making for a swap with friends. We take a little sewing vacation in Central California every year and have done a pillow swap before. This will be the first time we’re swapping quilts with each other! Linen and other naturals with pops of color. Carolyn Friedlander! I love the Architextures line so much! I’m also really excited for her future releases. Plus, she’s super-sweet! No matter how specific your talents are, there’s always going to be a job out there that embraces that ability and uses it to the fullest. People are really surprised when I tell them what I do now for a living. My friends have all said that this job is so “me,” which I couldn’t agree with more. It’s lots of work, but I love every minute of it. Follow along with Nichole's sewing and quilting adventures via her blog and Instagram.